Socrates: Is the origin of morality to be found in nature? Richard Dawkins claims to have found the origin of moral behavior. After spending my entire life searching for the origin of morality, I eagerly read Dawkins’ account of morality’s origins. Following Charles Darwin's lead, he believes that morality did not originate in the heavens but instead originated in nature. He explains the origin of morality in terms of evolution. It is evolved behavior. I remember talking to an interesting young man at the court of Archon Basileus while awaiting my pre-trial hearing. This was back in Athens around 399 B.C.E. The young man's name was Euthyphro. During our discussion a seemingly simple question emerged—a question that, when answered, revealed the separation of the gods from morality. I shall put the question in terms familiar to people of this century: Are actions moral because God commands them; or does God command actions because they are moral? This question exposes a most interesting dilemma. There is no way to answer the question sensibly. If we suggest that actions are moral because God commands them, then moral goodness is arbitrary. God could command that torture is good, and it would thus be good. But would we not find such a commandment to be abhorrent and not the sort of thing God would command? On the other hand, if we answer that God only commands actions because they are moral, we find ourselves with a God that has to check some measure from beyond himself before issuing commands. Thus, God would not be the source of morality. He would be reduced to the deliverer of moral wisdom that he must, himself, seek out. This conclusion is enacted by many creatures on Earth. We may agree that it is biologically effective, but we surely would question whether killing our competitors is morally good. So the mere fact that behavior has evolved does not guarantee its moral worth. 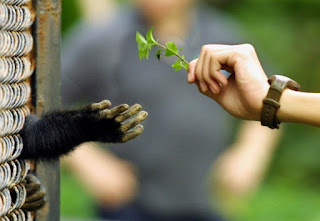 The reason the first version of the argument looks good is because we have reasoned that altruism is morally good prior to discovering an evolutionary explanation for it. The wise Dawkins agrees with this point. He tells us that he doesn't advocate a morality based on evolution. He has simply demonstrated that our moral behavior originated in evolution because it helps our survival.